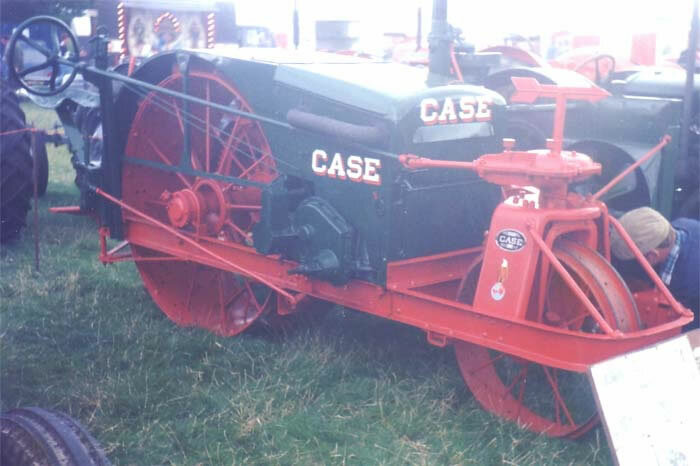 Case 10/20 1915 Tractor. Introduced in 1915 this 10-20 hp tractor was powered by a 4 cylinder transverse mounted engine. Running at 800 r.p.m. the engine was fitted with high-tension magneto ignition and impulse starter, cooling was by pump, fan and radiator, lubrication by splash and pump. The steering wheel was mounted on the right with the drivers seat directly behind the right rear wheel which was keyed to the axle. The rear left wheel was idle but could be locked to the axle by the means of a jaw clutch to give added traction. One forward gear gave a speed of 2 m.p.h., reverse was accomplished by a jaw clutch, final drive was by chain.